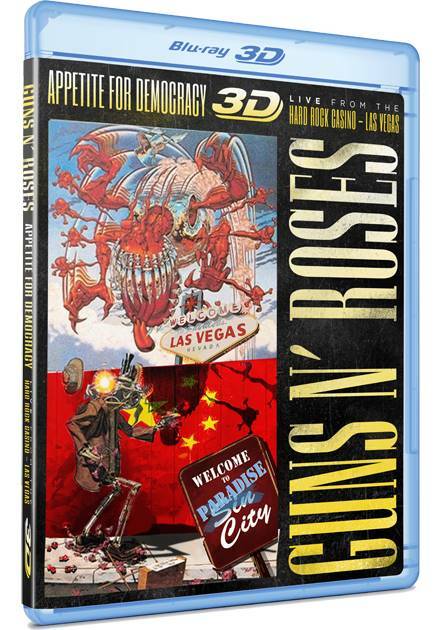 GUNS N' ROSES' 3D film, "Appetite For Democracy", will receive a theatrical release in early April. It will also be made available in several different formats, as detailed below. Filmed during GUNS N' ROSES' "Appetite For Democracy" residency at The Joint at Hard Rock Hotel & Casino' in Las Vegas, Nevada in November 2012, celebrating twenty-five years of "Appetite For Destruction" and four years of "Chinese Democracy", the elaborate Vegas-style production features Axl Rose at the top of his game with his current lineup performing some of GNR's biggest hits, including "Welcome To The Jungle", "Sweet Child O' Mine", "Mr. Brownstone", "November Rain" and "Paradise City". This is the first live concert release from GUNS N' ROSES since "Use Your Illusion II" in 1992. The "Appetite Of Democracy" package, with a running time of two hours and 47 minutes, is directed by Kerry Asmussen and produced by Barry Summers. The package will be available in four formats: a standard Amaray DVD, a 3D Blu-ray DVD, a Deluxe 2CD+DVD set and digital long form. The DVD and Blu-ray components both feature the full show, along with band interviews plus a 3D photo gallery, both with 5.1 surround and stereo audio. This absolute ambush on the city of sin, captured in HD/3D, puts you in the best seat in the house for an electrifying once in a lifetime live concert performance. For more information, visit gnr3dmovie.com. Following up on the successful residency in 2012, GUNS N' ROSES will play nine shows at The Joint in the Hard Rock Hotel & Casino starting May 21. Dubbed "No Trickery! An Evening Of Destruction", the concerts will highlight the entire GN'R catalog, from "Appetite For Destruction" to "Chinese Democracy".